Always fun watching the antics of moored boats down here. This boat is too long (over 60 feet) to take a mooring ball but did so anyway. The boat is tied to a mooring at the bow while the adjacent mooring (supposed to be for another boat) is under the boat's stern. A million dollar yacht with a paid captain and crew. Makes you wonder, doesn't it??? 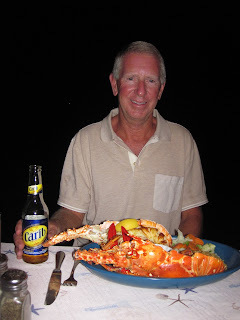 Anegada lobster. Ahhh, the best! 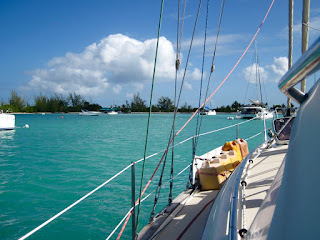 Anegada anchorage with Aspen floating with about 1 foot of water under her keel. Kind of shallow! 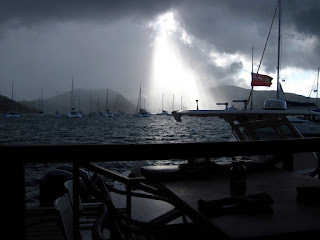 Squall from Saba Rock, North Sound, Virgin Gorda, BVI. Lots of sailors here! The Michael Beans show at Leverick Bay, Virgin Gorda, BVI. Always a fun time! The reef behind Saba Rock, North Sound, BVI. The charter catamaran didn't see the mile long reef for some reason and decided to just motor over it. That didn't work out so well. 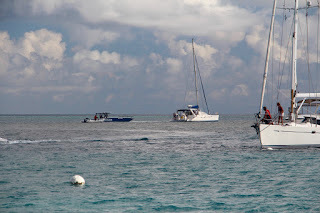 The police boat is trying to pull the catamaran off the reef, unsuccessfully. 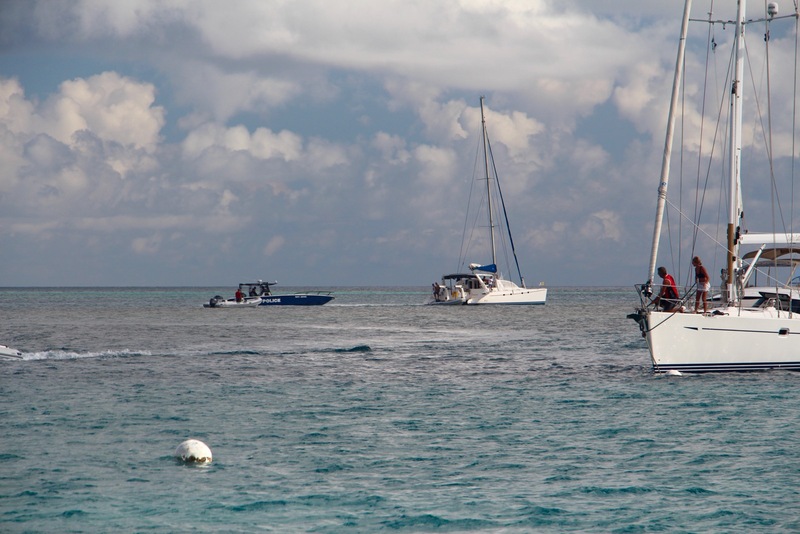 Three hours later, two salvage boats pulled the boat off without sinking her. I wouldn't want to own that charter boat! The Bitter End Resort. Admiral Maria's favorite place to visit! 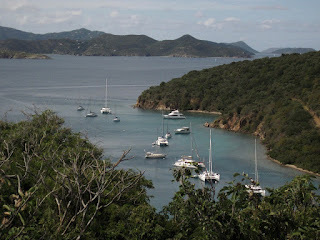 A parting shot from the infamous Willy T at Normal Island, BVI. Jumping from the top deck is world famous as you can see. February and ground hog day finds Aspen and her crew still in the British Virgin Islands. Since there are no ground hogs down here, for ground hog day, we waited for the elusive lizard (gecko) to make an appearance at the Saba Rock happy hour. The lizard was a no show indicating that there will be 6 more weeks of sun and plentiful rum down here in the tropics. We’re thinking of all of you up in the frigid north and your 6 more weeks of winter too. We’ve been on the move visiting more places here in the Virgins. 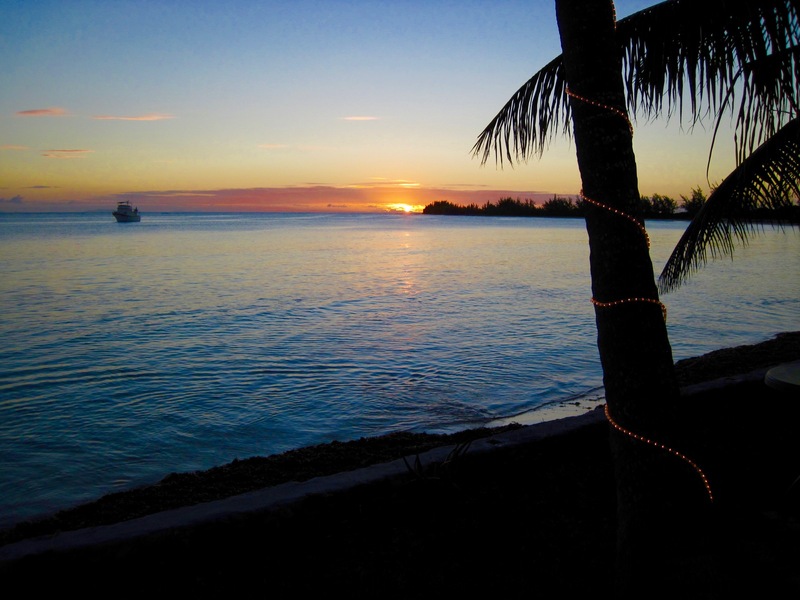 Trellis Bay and Anegada were on our list this season and they did not disappoint. 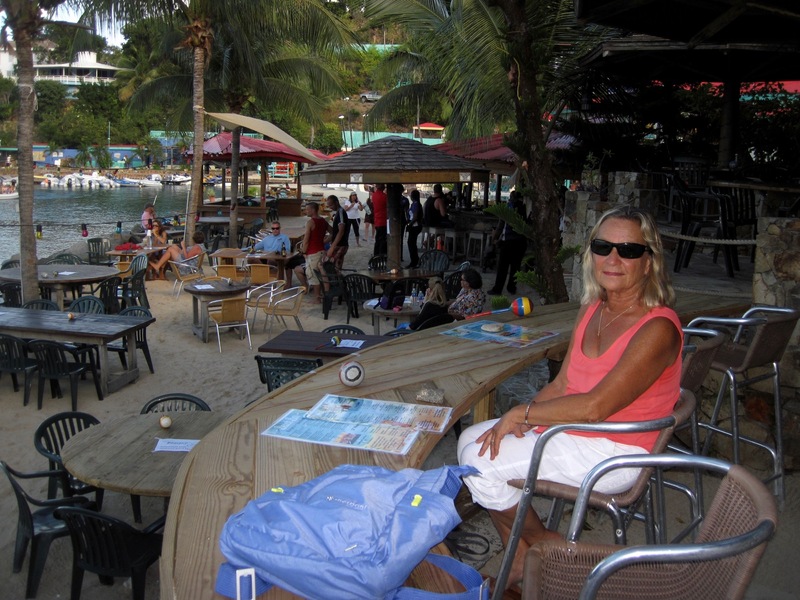 Trellis Bay has its’ artist shops and friendly sailor bars to enjoy along with great walks on the beach. Anegada, well that is a special place. 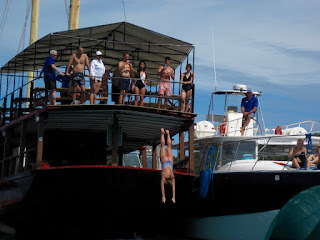 Dangerous reefs and extremely shallow water guard this jewel but sailors love a challenge. Aspen likes shallow water so it was no problem going deep into the anchorage where the waters were calm and inviting. 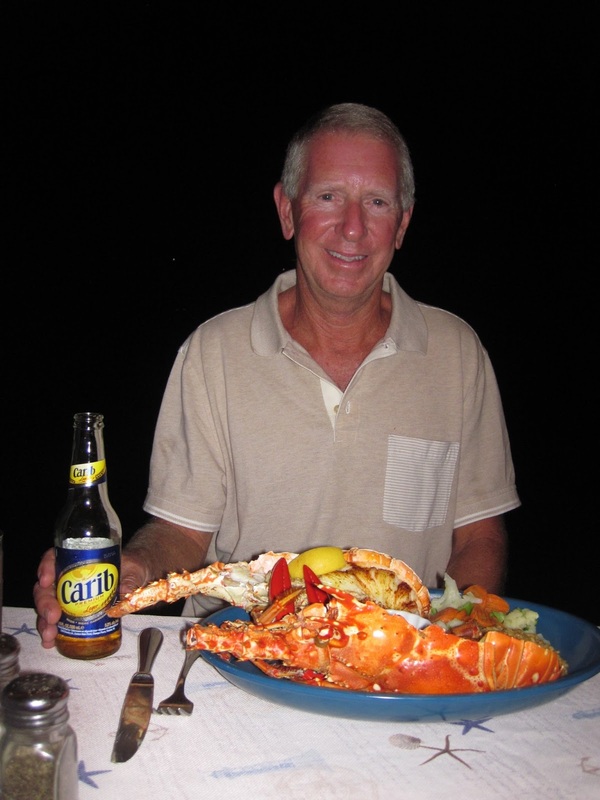 Anegada is known for lobsters, bone fishing and shipwrecks everywhere. We focused on the lobster and exploring the flat island (great for running). Cow Wreck Bay is closer than Loblolly Bay but both are well worth visiting if you happen to visit. Anegada is only about 20 miles away from Tortola but a world apart with its’ laid back atmosphere and friendly people. We visited there 18 years ago, according to Admiral Maria. Hmmm, it seems like only yesterday that we sailed there with our friends Tim and Deb and Bob and Linda on that charter boat. How time seems to fly! 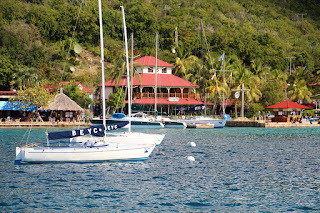 Today Aspen floats just off the Bitter End Resort in North Sound, Virgin Gorda. 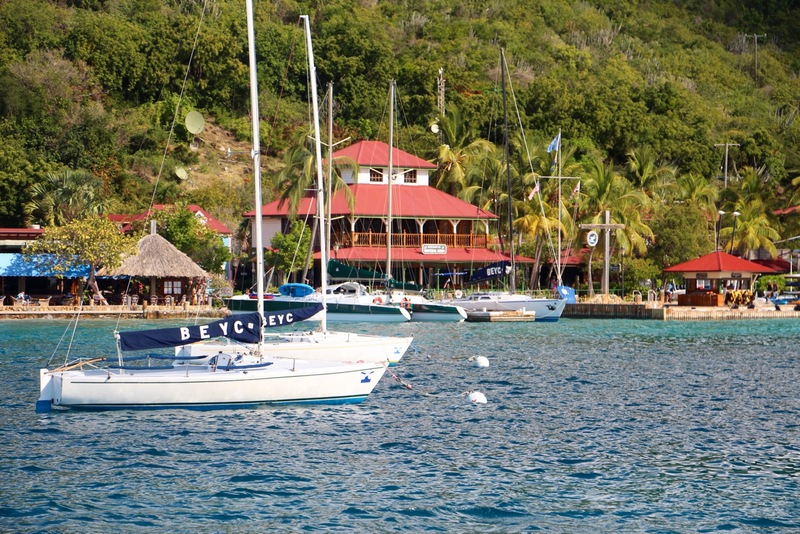 The resort welcomes sailors from near and far to enjoy this slice of paradise. Two nights ago we were treated to an enormous fireworks display, courtesy of Sir Richard Branson, from his second private island called Mosquito Island in our bay. The x-president of the United States happens to be visiting our little part of this world with Sir Richard so Sir Richard decided to light up the night sky with well over $100,000 worth of fire and exploding stars. It was pretty spectacular we have to say. Right next to the Bitter End Resort is a tiny rock named, appropriately, Saba Rock. 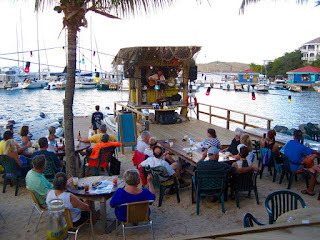 Happy hours of rum drinks and conch fritters are what make it a great place to enjoy the sunset, along with watching tarpon feeding for more entertainment. 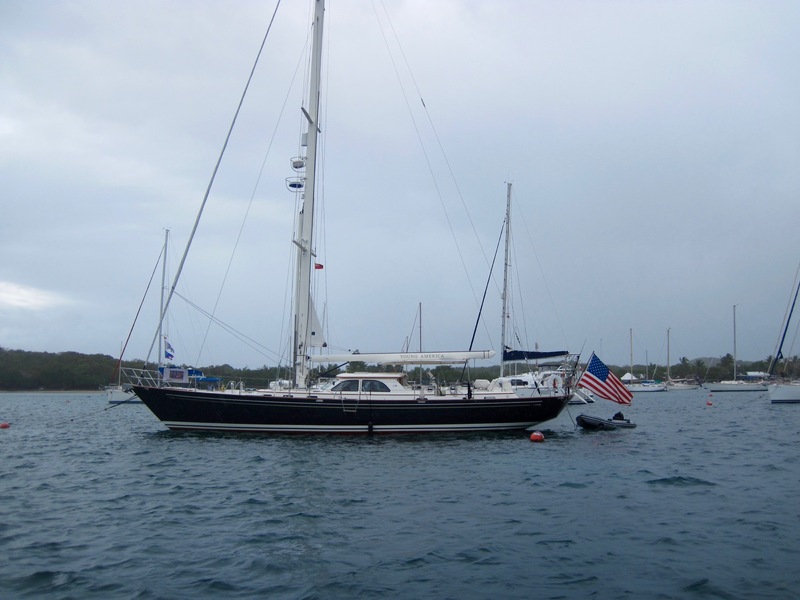 Aspen and her crew need a weather window (appropriate sailing conditions) to head south to Sint Maarten/St. Martin across the dreaded Anegada Passage. No, the Anegada Passage is not usually a fun or pleasant sail and many a ship and crew has come to grief if the weather is bad. So we sit here at the Bitter End waiting for the right sailing conditions and listening to weather from Denis our weather guru and fellow sailor each day. Soon, maybe in a week or so, the time will come and sail we will to even smaller latitudes.